The largest database1 of organic compounds lists about 10 million substances, which include compounds originating from living organisms and those synthesized by chemists. The number of potential organic compounds has been estimated2 at 1060—an astronomically high number. The existence of so many organic molecules is a consequence of the ability of carbon atoms to form up to four strong bonds to other carbon atoms, resulting in chains and rings of many different sizes, shapes, and complexities. The simplest organic compounds contain only the elements carbon and hydrogen, and are called hydrocarbons. Even though they are composed of only two types of atoms, there is a wide variety of hydrocarbons because they may consist of varying lengths of chains, branched chains, and rings of carbon atoms, or combinations of these structures. In addition, hydrocarbons may differ in the types of carbon-carbon bonds present in their molecules. Many hydrocarbons are found in plants, animals, and their fossils; other hydrocarbons have been prepared in the laboratory. We use hydrocarbons every day, mainly as fuels, such as natural gas, acetylene, propane, butane, and the principal components of gasoline, diesel fuel, and heating oil. The familiar plastics polyethylene, polypropylene, and polystyrene are also hydrocarbons. We can distinguish several types of hydrocarbons by differences in the bonding between carbon atoms. This leads to differences in geometries and in the hybridization of the carbon orbitals. Alkanes, or saturated hydrocarbons, contain only single covalent bonds between carbon atoms. Each of the carbon atoms in an alkane has sp3 hybrid orbitals and is bonded to four other atoms, each of which is either carbon or hydrogen. The Lewis structures and models of methane, ethane, and pentane are illustrated in [link]. Carbon chains are usually drawn as straight lines in Lewis structures, but one has to remember that Lewis structures are not intended to indicate the geometry of molecules. Notice that the carbon atoms in the structural models (the ball-and-stick and space-filling models) of the pentane molecule do not lie in a straight line. Because of the sp3 hybridization, the bond angles in carbon chains are close to 109.5°, giving such chains in an alkane a zigzag shape. The structures of alkanes and other organic molecules may also be represented in a less detailed manner by condensed structural formulas (or simply, condensed formulas). Instead of the usual format for chemical formulas in which each element symbol appears just once, a condensed formula is written to suggest the bonding in the molecule. These formulas have the appearance of a Lewis structure from which most or all of the bond symbols have been removed. Condensed structural formulas for ethane and pentane are shown at the bottom of [link], and several additional examples are provided in the exercises at the end of this chapter. Pictured are the Lewis structures, ball-and-stick models, and space-filling models for molecules of methane, ethane, and pentane. A common method used by organic chemists to simplify the drawings of larger molecules is to use a skeletal structure (also called a line-angle structure). In this type of structure, carbon atoms are not symbolized with a C, but represented by each end of a line or bend in a line. Hydrogen atoms are not drawn if they are attached to a carbon. Other atoms besides carbon and hydrogen are represented by their elemental symbols. [link] shows three different ways to draw the same structure. The same structure can be represented three different ways: an expanded formula, a condensed formula, and a skeletal structure. There are eight places where lines intersect or end, meaning that there are eight carbon atoms in the molecule. Since we know that carbon atoms tend to make four bonds, each carbon atom will have the number of hydrogen atoms that are required for four bonds. This compound contains 16 hydrogen atoms for a molecular formula of C8H16. All alkanes are composed of carbon and hydrogen atoms, and have similar bonds, structures, and formulas; noncyclic alkanes all have a formula of CnH2n+2. The number of carbon atoms present in an alkane has no limit. Greater numbers of atoms in the molecules will lead to stronger intermolecular attractions (dispersion forces) and correspondingly different physical properties of the molecules. Properties such as melting point and boiling point ([link]) usually change smoothly and predictably as the number of carbon and hydrogen atoms in the molecules change. Identifying isomers from Lewis structures is not as easy as it looks. 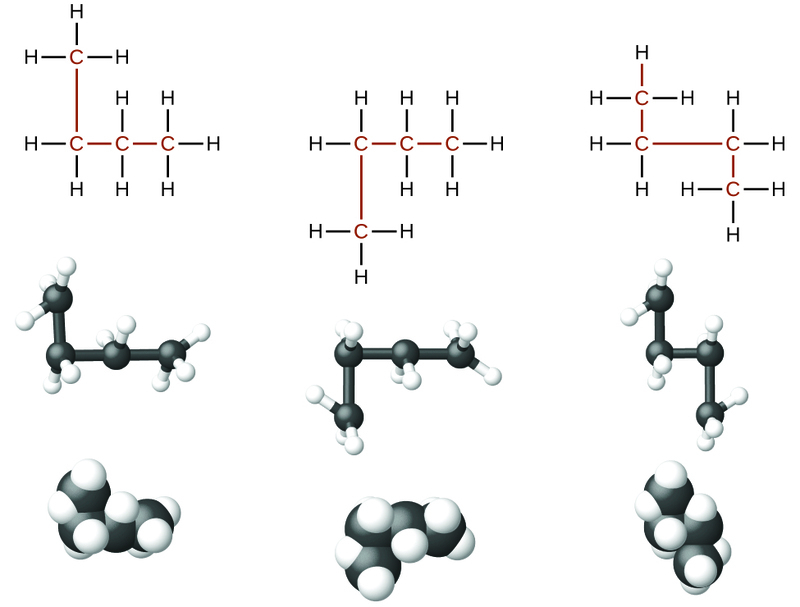 Lewis structures that look different may actually represent the same isomers. For example, the three structures in [link] all represent the same molecule, n-butane, and hence are not different isomers. They are identical because each contains an unbranched chain of four carbon atoms. These three representations of the structure of n-butane are not isomers because they all contain the same arrangement of atoms and bonds. To name an alkane, first identify the longest chain of carbon atoms in its structure. 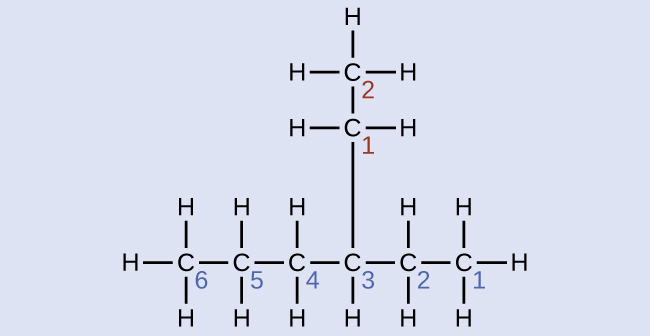 A two-carbon chain is called ethane; a three-carbon chain, propane; and a four-carbon chain, butane. Longer chains are named as follows: pentane (five-carbon chain), hexane (6), heptane (7), octane (8), nonane (9), and decane (10). These prefixes can be seen in the names of the alkanes described in [link]. Add prefixes to the name of the longest chain to indicate the positions and names of substituents. Substituents are branches or functional groups that replace hydrogen atoms on a chain. The position of a substituent or branch is identified by the number of the carbon atom it is bonded to in the chain. We number the carbon atoms in the chain by counting from the end of the chain nearest the substituents. Multiple substituents are named individually and placed in alphabetical order at the front of the name. When more than one substituent is present, either on the same carbon atom or on different carbon atoms, the substituents are listed alphabetically. Because the carbon atom numbering begins at the end closest to a substituent, the longest chain of carbon atoms is numbered in such a way as to produce the lowest number for the substituents. The ending -o replaces -ide at the end of the name of an electronegative substituent (in ionic compounds, the negatively charged ion ends with -ide like chloride; in organic compounds, such atoms are treated as substituents and the -o ending is used). The number of substituents of the same type is indicated by the prefixes di- (two), tri- (three), tetra- (four), and so on (for example, difluoro- indicates two fluoride substituents). The four-carbon chain is numbered from the end with the chlorine atom. This puts the substituents on positions 1 and 2 (numbering from the other end would put the substituents on positions 3 and 4). Four carbon atoms means that the base name of this compound will be butane. The bromine at position 2 will be described by adding 2-bromo-; this will come at the beginning of the name, since bromo- comes before chloro- alphabetically. The chlorine at position 1 will be described by adding 1-chloro-, resulting in the name of the molecule being 2-bromo-1-chlorobutane. The open bonds in the methyl and ethyl groups indicate that these alkyl groups are bonded to another atom. SolutionThe longest carbon chain runs horizontally across the page and contains six carbon atoms (this makes the base of the name hexane, but we will also need to incorporate the name of the branch). In this case, we want to number from right to left (as shown by the blue numbers) so the branch is connected to carbon 3 (imagine the numbers from left to right—this would put the branch on carbon 4, violating our rules). The branch attached to position 3 of our chain contains two carbon atoms (numbered in red)—so we take our name for two carbons eth- and attach -yl at the end to signify we are describing a branch. Putting all the pieces together, this molecule is 3-ethylhexane. 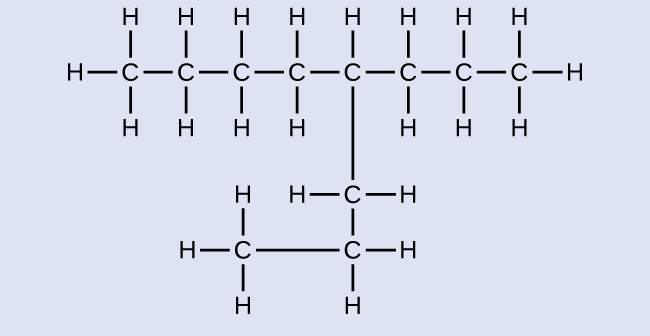 Each of the six equivalent hydrogen atoms of the first type in propane and each of the nine equivalent hydrogen atoms of that type in 2-methylpropane (all shown in black) are bonded to a carbon atom that is bonded to only one other carbon atom. The two purple hydrogen atoms in propane are of a second type. They differ from the six hydrogen atoms of the first type in that they are bonded to a carbon atom bonded to two other carbon atoms. The green hydrogen atom in 2-methylpropane differs from the other nine hydrogen atoms in that molecule and from the purple hydrogen atoms in propane. The green hydrogen atom in 2-methylpropane is bonded to a carbon atom bonded to three other carbon atoms. Two different alkyl groups can be formed from each of these molecules, depending on which hydrogen atom is removed. 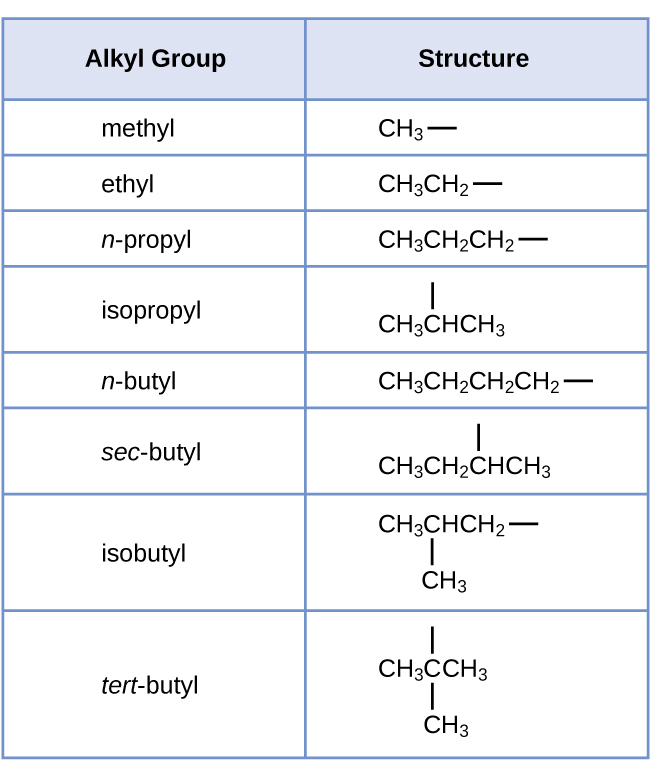 The names and structures of these and several other alkyl groups are listed in [link]. This listing gives the names and formulas for various alkyl groups formed by the removal of hydrogen atoms from different locations. Alkanes burn in the presence of oxygen, a highly exothermic oxidation-reduction reaction that produces carbon dioxide and water. As a consequence, alkanes are excellent fuels. For example, methane, CH4, is the principal component of natural gas. 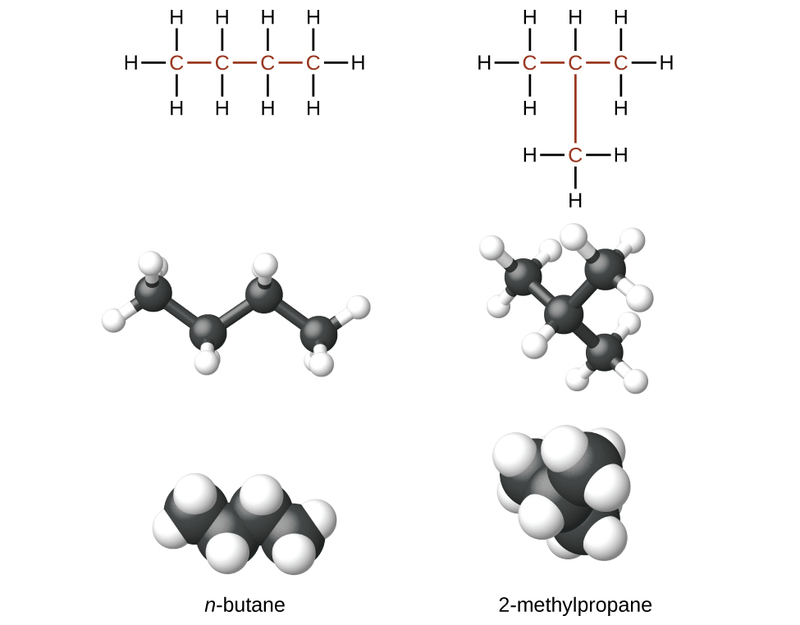 Butane, C4H10, used in camping stoves and lighters is an alkane. Gasoline is a liquid mixture of continuous- and branched-chain alkanes, each containing from five to nine carbon atoms, plus various additives to improve its performance as a fuel. Kerosene, diesel oil, and fuel oil are primarily mixtures of alkanes with higher molecular masses. The main source of these liquid alkane fuels is crude oil, a complex mixture that is separated by fractional distillation. Fractional distillation takes advantage of differences in the boiling points of the components of the mixture (see [link]). You may recall that boiling point is a function of intermolecular interactions, which was discussed in the chapter on solutions and colloids. The C–Cl portion of the chloroethane molecule is an example of a functional group, the part or moiety of a molecule that imparts a specific chemical reactivity. The types of functional groups present in an organic molecule are major determinants of its chemical properties and are used as a means of classifying organic compounds as detailed in the remaining sections of this chapter. Want more practice naming alkanes? Watch this brief video tutorial to review the nomenclature process. Organic compounds that contain one or more double or triple bonds between carbon atoms are described as unsaturated. You have likely heard of unsaturated fats. These are complex organic molecules with long chains of carbon atoms, which contain at least one double bond between carbon atoms. Unsaturated hydrocarbon molecules that contain one or more double bonds are called alkenes. Carbon atoms linked by a double bond are bound together by two bonds, one σ bond and one π bond. Double and triple bonds give rise to a different geometry around the carbon atom that participates in them, leading to important differences in molecular shape and properties. The differing geometries are responsible for the different properties of unsaturated versus saturated fats. Ethene, C2H4, is the simplest alkene. Each carbon atom in ethene, commonly called ethylene, has a trigonal planar structure. The second member of the series is propene (propylene) ([link]); the butene isomers follow in the series. Four carbon atoms in the chain of butene allows for the formation of isomers based on the position of the double bond, as well as a new form of isomerism. Expanded structures, ball-and-stick structures, and space-filling models for the alkenes ethene, propene, and 1-butene are shown. Ethylene (the common industrial name for ethene) is a basic raw material in the production of polyethylene and other important compounds. Over 135 million tons of ethylene were produced worldwide in 2010 for use in the polymer, petrochemical, and plastic industries. Ethylene is produced industrially in a process called cracking, in which the long hydrocarbon chains in a petroleum mixture are broken into smaller molecules. Polymers (from Greek words poly meaning “many” and mer meaning “parts”) are large molecules made up of repeating units, referred to as monomers. Polymers can be natural (starch is a polymer of sugar residues and proteins are polymers of amino acids) or synthetic [like polyethylene, polyvinyl chloride (PVC), and polystyrene]. The variety of structures of polymers translates into a broad range of properties and uses that make them integral parts of our everyday lives. Adding functional groups to the structure of a polymer can result in significantly different properties (see the discussion about Kevlar later in this chapter). An example of a polymerization reaction is shown in [link]. The monomer ethylene (C2H4) is a gas at room temperature, but when polymerized, using a transition metal catalyst, it is transformed into a solid material made up of long chains of –CH2– units called polyethylene. Polyethylene is a commodity plastic used primarily for packaging (bags and films). The reaction for the polymerization of ethylene to polyethylene is shown. Polyethylene is a member of one subset of synthetic polymers classified as plastics. Plastics are synthetic organic solids that can be molded; they are typically organic polymers with high molecular masses. Most of the monomers that go into common plastics (ethylene, propylene, vinyl chloride, styrene, and ethylene terephthalate) are derived from petrochemicals and are not very biodegradable, making them candidate materials for recycling. Recycling plastics helps minimize the need for using more of the petrochemical supplies and also minimizes the environmental damage caused by throwing away these nonbiodegradable materials. Plastic recycling is the process of recovering waste, scrap, or used plastics, and reprocessing the material into useful products. For example, polyethylene terephthalate (soft drink bottles) can be melted down and used for plastic furniture, in carpets, or for other applications. Other plastics, like polyethylene (bags) and polypropylene (cups, plastic food containers), can be recycled or reprocessed to be used again. Many areas of the country have recycling programs that focus on one or more of the commodity plastics that have been assigned a recycling code (see [link]). These operations have been in effect since the 1970s and have made the production of some plastics among the most efficient industrial operations today. Each type of recyclable plastic is imprinted with a code for easy identification. Molecules of 1-butene and 2-butene are structural isomers; the arrangement of the atoms in these two molecules differs. As an example of arrangement differences, the first carbon atom in 1-butene is bonded to two hydrogen atoms; the first carbon atom in 2-butene is bonded to three hydrogen atoms. The compound 2-butene and some other alkenes also form a second type of isomer called a geometric isomer. In a set of geometric isomers, the same types of atoms are attached to each other in the same order, but the geometries of the two molecules differ. Geometric isomers of alkenes differ in the orientation of the groups on either side of a bond. These molecular models show the structural and geometric isomers of butene. This molecule is now a substituted alkane and will be named as such. The base of the name will be pentane. We will count from the end that numbers the carbon atoms where the chlorine atoms are attached as 2 and 3, making the name of the product 2,3-dichloropentane. Hydrocarbon molecules with one or more triple bonds are called alkynes; they make up another series of unsaturated hydrocarbons. Two carbon atoms joined by a triple bond are bound together by one σ bond and two π bonds. The sp-hybridized carbons involved in the triple bond have bond angles of 180°, giving these types of bonds a linear, rod-like shape. The IUPAC nomenclature for alkynes is similar to that for alkenes except that the suffix -yne is used to indicate a triple bond in the chain. For example, is called 1-butyne. Carbon atoms 1 and 4 have four single bonds and are thus tetrahedral with sp3 hybridization. Carbon atoms 2 and 3 are involved in the triple bond, so they have linear geometries and would be classified as sp hybrids. Acetylene and the other alkynes also burn readily. An acetylene torch takes advantage of the high heat of combustion for acetylene. Valence bond theory describes the benzene molecule and other planar aromatic hydrocarbon molecules as hexagonal rings of sp2-hybridized carbon atoms with the unhybridized p orbital of each carbon atom perpendicular to the plane of the ring. Three valence electrons in the sp2 hybrid orbitals of each carbon atom and the valence electron of each hydrogen atom form the framework of σ bonds in the benzene molecule. The fourth valence electron of each carbon atom is shared with an adjacent carbon atom in their unhybridized p orbitals to yield the π bonds. Benzene does not, however, exhibit the characteristics typical of an alkene. Each of the six bonds between its carbon atoms is equivalent and exhibits properties that are intermediate between those of a C–C single bond and a double bond. To represent this unique bonding, structural formulas for benzene and its derivatives are typically drawn with single bonds between the carbon atoms and a circle within the ring as shown in [link]. This condensed formula shows the unique bonding structure of benzene. Toluene and xylene are important solvents and raw materials in the chemical industry. Styrene is used to produce the polymer polystyrene. Draw three isomers of a six-membered aromatic ring compound substituted with two bromines. Strong, stable bonds between carbon atoms produce complex molecules containing chains, branches, and rings. The chemistry of these compounds is called organic chemistry. Hydrocarbons are organic compounds composed of only carbon and hydrogen. The alkanes are saturated hydrocarbons—that is, hydrocarbons that contain only single bonds. Alkenes contain one or more carbon-carbon double bonds. Alkynes contain one or more carbon-carbon triple bonds. Aromatic hydrocarbons contain ring structures with delocalized π electron systems. What is the difference between the hybridization of carbon atoms’ valence orbitals in saturated and unsaturated hydrocarbons? On a microscopic level, how does the reaction of bromine with a saturated hydrocarbon differ from its reaction with an unsaturated hydrocarbon? How are they similar? Both reactions result in bromine being incorporated into the structure of the product. The difference is the way in which that incorporation takes place. In the saturated hydrocarbon, an existing C–H bond is broken, and a bond between the C and the Br can then be formed. In the unsaturated hydrocarbon, the only bond broken in the hydrocarbon is the π bond whose electrons can be used to form a bond to one of the bromine atoms in Br2 (the electrons from the Br–Br bond form the other C–Br bond on the other carbon that was part of the π bond in the starting unsaturated hydrocarbon). On a microscopic level, how does the reaction of bromine with an alkene differ from its reaction with an alkyne? How are they similar? Explain why unbranched alkenes can form geometric isomers while unbranched alkanes cannot. Does this explanation involve the macroscopic domain or the microscopic domain? Unbranched alkanes have free rotation about the C–C bonds, yielding all orientations of the substituents about these bonds equivalent, interchangeable by rotation. In the unbranched alkenes, the inability to rotate about the bond results in fixed (unchanging) substituent orientations, thus permitting different isomers. Since these concepts pertain to phenomena at the molecular level, this explanation involves the microscopic domain. They are the same compound because each is a saturated hydrocarbon containing an unbranched chain of six carbon atoms. How does the carbon-atom hybridization change when polyethylene is prepared from ethylene? Butane is used as a fuel in disposable lighters. Write the Lewis structure for each isomer of butane. Write Lewis structures and name the five structural isomers of hexane. Write structures for the three isomers of the aromatic hydrocarbon xylene, C6H4(CH3)2. (a) What is the IUPAC name for the compound? (b) Name the other isomers that contain a five-carbon chain with three methyl substituents. Write Lewis structures and IUPAC names for the alkyne isomers of C4H6. Write Lewis structures and IUPAC names for all isomers of C4H9Cl. Name and write the structures of all isomers of the propyl and butyl alkyl groups. Write the structures for all the isomers of the –C5H11 alkyl group. Draw Lewis structures for these compounds, with resonance structures as appropriate, and determine the hybridization of the carbon atoms in each. In acetylene, the bonding uses sp hybrids on carbon atoms and s orbitals on hydrogen atoms. In benzene, the carbon atoms are sp2 hybridized. Teflon is prepared by the polymerization of tetrafluoroethylene. Write the equation that describes the polymerization using Lewis symbols. Write two complete, balanced equations for each of the following reactions, one using condensed formulas and one using Lewis structures. (a) 1 mol of 1-butyne reacts with 2 mol of iodine. (b) Pentane is burned in air. (a) 2-butene reacts with chlorine. (b) benzene burns in air. What mass of 2-bromopropane could be prepared from 25.5 g of propene? Assume a 100% yield of product. Acetylene is a very weak acid; however, it will react with moist silver(I) oxide and form water and a compound composed of silver and carbon. Addition of a solution of HCl to a 0.2352-g sample of the compound of silver and carbon produced acetylene and 0.2822 g of AgCl. (a) What is the empirical formula of the compound of silver and carbon? (b) The production of acetylene on addition of HCl to the compound of silver and carbon suggests that the carbon is present as the acetylide ion, . Write the formula of the compound showing the acetylide ion. How many kilograms of ethylene is produced by the pyrolysis of 1.000 103 kg of ethane, assuming a 100.0% yield? 1 This is the Beilstein database, now available through the Reaxys site (www.elsevier.com/online-tools/reaxys). 2 Peplow, Mark. “Organic Synthesis: The Robo-Chemist,” Nature 512 (2014): 20–2. 3 Physical properties for C4H10 and heavier molecules are those of the normal isomer, n-butane, n-pentane, etc. 4 STP indicates a temperature of 0 °C and a pressure of 1 atm. reaction in which a double carbon-carbon bond forms a single carbon-carbon bond by the addition of a reactant. Typical reaction for an alkene. Hydrocarbons by OpenStaxCollege is licensed under a Creative Commons Attribution 4.0 International License, except where otherwise noted.